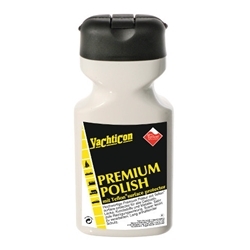 Premium Polish is made with Teflon® surface protector. It is a polish for all kinds of fiber glass, gel coat, and painted surfaces. It provides outstanding protection against fading and oxidation and removes dirt, stains, and salt.